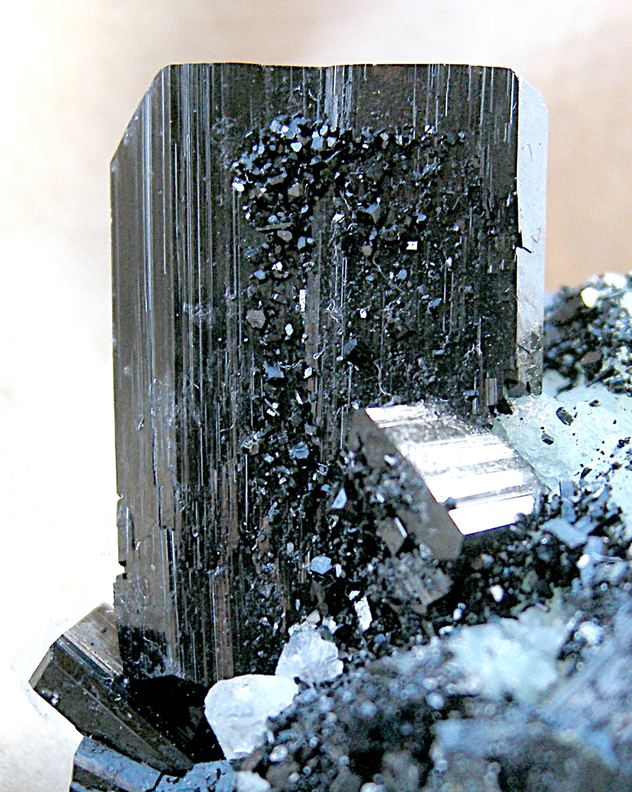 Babingtonite: Mineral information, data and localities. 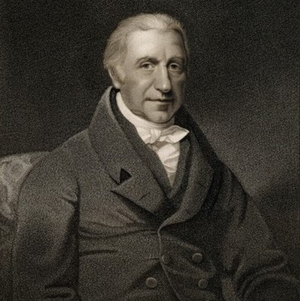 Named after Dr. William Babington [May 21, 1756 Portglenone, near Coleraine, County Antrim, Northern Ireland, UK - April 29, 1833 London, England, UK, physician and mineralogist, curator of the John Stuart, 3rd Earl of Bute mineral collection until 1792, founding member and President (from 1822 to 1824) of the Geological Society of London and author of noted systematic books on mineralogy (1796, 1799). Quartz 351 photos of Babingtonite associated with Quartz on mindat.org. Prehnite 335 photos of Babingtonite associated with Prehnite on mindat.org. Calcite 136 photos of Babingtonite associated with Calcite on mindat.org. Heulandite-Ca 39 photos of Babingtonite associated with Heulandite-Ca on mindat.org. Epidote 30 photos of Babingtonite associated with Epidote on mindat.org. Stilbite-Ca 21 photos of Babingtonite associated with Stilbite-Ca on mindat.org. Heulandite subgroup 21 photos of Babingtonite associated with Heulandite subgroup on mindat.org. Albite 14 photos of Babingtonite associated with Albite on mindat.org. Byssolite 11 photos of Babingtonite associated with Byssolite on mindat.org. Apophyllite 10 photos of Babingtonite associated with Apophyllite on mindat.org. 9.DK.10 Santaclaraite CaMn4[Si5O14OH](OH) · H2O Tric. 9.DK.20 Hellandite-(Y) (Ca,REE)4Y2Al◻2(B4Si4O22) (OH)2 Mon. Washington, H.S. and Merwin, H.E. (1923) On Babingtonite. American Mineralogist: 8: 215-223. Palache, C. & Gonyer, F.A. (1932): On babingtonite. American Mineralogist: 17: 295-303. Burt, D.M. (1971) Multisystems analysis of the relative stabilities of babingtonite and ilvaite. Carnegie Inst. Annu. Rep. Geophys. Lab., 70, 189-197. Araki, T. and Zoltai, T. (1972) Crystal structure of babingtonite. Z. Kristallogr. : 135: 355-373. Kosoi, A.L. (1976) The structure of babingtonite. Sov. Phys. Crystallogr., 20, 446-451. Franzini, M., Leoni, L., Mellini, M., and Orlandi, P. (1978) The babingtonite of Figlini (Prato), Italy. Rend. Soc. Ital. Mineral. Petrol., 34, 45-50. Czank, M. (1981) Chain periodicity faults in babingtonite, Ca2Fe2+Fe3+H[Si5O15]. Acta Crystallographica: A37: 617-620. Gole, M.J. (1981) Ca-Fe-Si skarns containing babingtonite: first known occurrence in Australia. Canadian Mineralogist, 19, 269-277. Duggan, M.B. (1986) Babingtonite and Fe-rich Ca-Al silicates from western Southland, New Zealand. Mineralogical Magazine: 50: 657-665. Tagai, T., Joswig, W., and Fuess, H. (1990) Neutron diffraction study of babingtonite at 80 K. Mineral. J.: 15: 8-18. Burns. R.G. and Dyar, M.D. (1991) Crystal chemistry and Mössbauer spectra of babingtonite. American Mineralogist: 76: 892-899. Janeczek, J. and Sachanbinski, M. (1992) Babingtonite, Y-Al-rich titanite, and zoned epidote from the Strzegom pegmatites, Poland. European Journal of Mineralogist: 4: 307-319. Armbruster, T., Stalder, H.A., Gnoss, E., Hofmann, B., and Herwegh, M. (2000) Epitaxy of hedenbergite whiskers on babingtonite in Alpine fissures at Arvigo, Val Calanca, Grisons, Switzerland. Schweizerische Mineralogische und Petrografische Mitteilungen, 80: 285-290. Walter, F., Ettinger, K. and Worel, K. (2004) Babingtonit aus einer alpinen Kluft im Seebachtal bei Mallnitz, Kärnten. Carinthia II, 194./114. : 209-216. Walter, F. and Ettinger, K. (2005) 1404) Babingtonit vom Seebachtal bei Mallnitz und Bemerkungen zum Vorkommen von „Babingtonit" vom Krennkogel, südliche Koralpe. Pp. 287-288 in Niedermayr, G. et al. (2005) Neue Mineralfunde aus Österreich LIV. Carinthia II, 195./115., 277-315. Akasaka, M., Kimura, T. and Nagashima, M. (2013): X-ray Rietveld and 57Fe Moessbauer study of babingtonite from Kouragahana, Shimane Peninsula, Japan. Journal of Mineralogical and Petrological Sciences, 108, 121-130. Nagashima, M., Mitani, K. and Akasaka, M. (2014) Structural variation of babingtonite depending on cation distribution at the octahedral sites. Mineralogy and Petrology, 108, 287-301. Nagashima. M. and Nishio-Hamane, D. (2018): TEM study of the epitaxial association of hedenbergite whiskers with babingtonite. Mineralogical Magazine, 82, 23-33. The following Babingtonite specimens are currently listed for sale on minfind.com. \"Zeolites in Tertiary basalts of the Canberra Region\" (author not known at this time). Walter, F., Ettinger, K. and Worel, K. (2004) Babingtonit aus einer alpinen Kluft im Seebachtal bei Mallnitz, Kärnten. Carinthia II, 194./114. : 209-216.; Walter, F. and Ettinger, K. (2005) 1404) Babingtonit vom Seebachtal bei Mallnitz und Bemerkungen zum Vorkommen von „Babingtonit" vom Krennkogel, südliche Koralpe. Pp. 287-288 in Niedermayr, G. et al. (2005) Neue Mineralfunde aus Österreich LIV. Carinthia II, 195./115., 277-315. Stefan, F. (1978) Bericht über die Frühjahrstagung der Fachgruppe für Mineralogie und Geologie 1978. Der Karinthin, 79: 41-45.; Walter, F. (1992) Mitteilungen der Österreichischen Mineralogischen Gesellschaft 137: 212-216.; Walter, F., Ettinger, K. and Worel, K. (2004) Babingtonit aus einer alpinen Kluft im Seebachtal bei Mallnitz, Kärnten. Carinthia II, 194./114. : 209-216 (referring to Stefan, 1978). ; Walter, F. and Ettinger, K. (2005) 1404) Babingtonit vom Seebachtal bei Mallnitz und Bemerkungen zum Vorkommen von „Babingtonit" vom Krennkogel, südliche Koralpe. Pp. 287-288 in Niedermayr, G. et al. (2005): Neue Mineralfunde aus Österreich LIV. Carinthia II, 195./115., 277-315. Kolitsch, U. & Gröbner, J. (2011): 1686) Babingtonit vom Krummsee bei St. Leonhard im Pitztal. P. 154 in Niedermayr, G. et al. 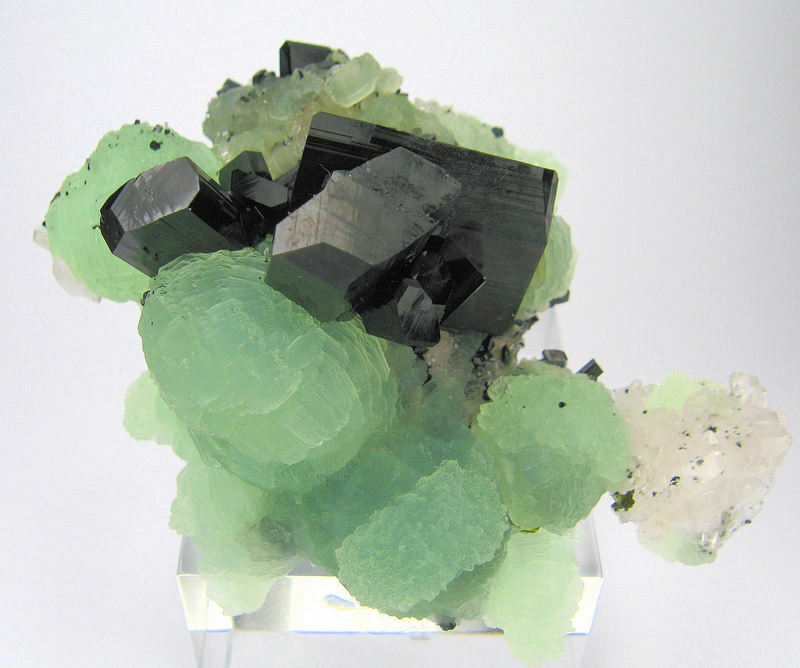 (2011): Neue Mineralfunde aus Österreich LX. Carinthia II, 201./121., 135-186. Rock Currier specimens (Jewel Tunnel Imports); Safaa Yu specimen. Ottens, B. (2008): Lapis 33 (6), 21-30; Fabre Minerals. Novotný, P.: Babingtonit z Vernířovic. Minerál, 2002, roč. 10, č. 5, s. 337-340. Novotný, P.: Minerály žil alpského typu v severovýchodní části Českého masivu. Zprávy Vlastivědného muzea v Olomouci, 2004, č. 281, s. 13-63. Kouřimský, J.: Thaumasit und Babingtonit, Neue Minerale für die ČSSR. Acta Universitatis Carolinae – Geologica, 1977, vol. 21, nos. 3-4, s. 213-217. Schupp, M., Hohl, J.L. & Parodi, G.C. (2012): Une occurence à babingtonite, datolite et préhnite dans le massif du Rossberg, Vosges du Sud. Le Règne Minéral, 104, 27-32. Baldizzone, G. (2008): I minerali del piacentino – come riconoscerli dove trovarli. Stampa Tipolito Farnese, Piacenza, 113 pp. - Albertini,C. (2000) : Ritrovamenti nel Rio Inferno, Brughiere di Omegna. 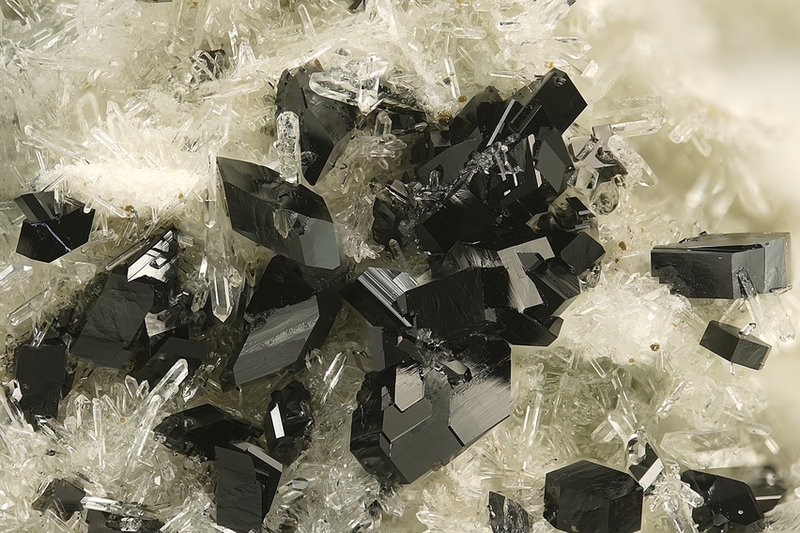 Prima segnalazione nel granito di Baveno : uranofane-beta - Rivista Mineralogica Italiana, Milano, XXIV, 2, 88-92. Gentile P. (1985): Babingtonite di Rencio, Crodo (Valle Antigorio - NO). Riv. Mineral. Ital., 9, 4 (4-1985), 145; Piccoli, G.C., Maletto, G., Bosio, P., Lombardo, B. (2007). Minerali del Piemonte e della Valle d'Aosta. Associazione Amici del Museo "F. Eusebio" Alba, Ed., Alba (Cuneo) 607 pp. • Gamboni, A., Cuccuru, S., Casini, L. & Marini, A. (2012)- I minerali del Monte Mazzolu, Cava Lu Patenti, Arzachena (OT), Sardegna. Rivista Mineralogica Italiana, 3/2012, 144-157. S. Cuccuru, A. Gamboni & L. Casini (2011): The Mt. Mazzolu quarry: a new mineralogical locality. PLINIUS 37, 304. - Gamboni, A., Gamboni, T., Pileri, P. (1997): Su alcuni minerali del massiccio granitico del monte Limbara zona "Furru e Conca", comune di Calangianus. Rivista Mineralogica Italiana, 2/1997, 123-134. Gamboni, A., Gamboni, T. (1998) - Babingtonite e "Granati" delle pegmatiti granitiche della Gallura, Sardegna nord-orientale. Rivista Mineralogica Italiana, 4, Milano. Bardi, T., Becucci, A. & Biagioni, C. (2012): Monte Beni - I minerali dell'ex cava Fantoni (Pietramala, Firenzuola, Firenze). MICRO, 3/2012, 98-109. Franzini M., Leoni L., Mellini M., Orlandi P. (1978): The babingtonite of Figline (Prato, Italy). Rend. Soc. Ital. Mineral. Petr., 34, 1, 45-50; Boscardin. M (1978): Informazioni di mineralogia Italiana. 75 - Babingtonite di Figline (Toscana). Riv. Mineral. Ital., 9, 4, 86.
erroneously reported in Handbook of Mineralogy. Nomura et al (1984) Chigaku Kenkyu, 35, 153-156. Von Bezing, L., Bode, R., and Jahn, S., (2008) Namibia Minerals and Localities. Edition Schloss Freudenstein, Bode Verlag GmbH, Haltern. 264 pp (in English). Pers. comm. Rune S. Selbekk 2007; Selbekk R.S. (2010): Norges mineraler. En revidert utgave av Norges mineraler (Neumann 1985).Tapir-NGU-NHM. J. Janeczek and M. Sachanbinski, Eur. Journ. Mineral. , 1992, 4, pp. 307-319. Weibel, M., Graeser, S., Oberholzer, W.F., Stalder, H.A., and Gabriel, W. (1990) Die Mineralien der Schweiz. 5th ed., Birkhäuser Verlag, Basel, 222 pp. ; Armbruster, T., Stalder, H.A., Gnoss, E., Hofmann, B., and Herwegh, M. (2000) Epitaxy of hedenbergite whiskers on babingtonite in Alpine fissures at Arvigo, Val Calanca, Grisons, Switzerland. Schweizerische mineralogische und petrografische Mitteilungen: 80(3): 285-290.; Walter, F., Ettinger, K. and Worel, K. (2004) Babingtonit aus einer alpinen Kluft im Seebachtal bei Mallnitz, Kärnten. Carinthia II, 194./114. : 209-216. Anthony, J.W., et al (1995), Mineralogy of Arizona, 3rd.ed. : 333. Roberts, Rapp, & Weber, 1974. Encylopedia of Minerals, plate 11. Januzzi, 1976. Mineral Localities of CT and Southeastern NY State, p.209. Shepard, Charles U. (1852). A Treatise on Mineralogy, 3rd ed., p.183. Rocks & Min. : 13:183; 19:244; 21:75.; Richmond, W. E. Jr. (1936): Paragenesis of the Minerals From Blueberry Mountain, Woburn, Massachusetts (American Mineralogist 22:290). Palache, C. and Fraprie, F. R. (1902). Babingtonite from Athol, Mass. (Proceedings of the American Academy of Arts and Sciences 38:391-393). Palache, Charles and Gonyer, F. A. (1931): On Babingtonite. American Mineralogist: 17: 295. Observed/collected August 2011 and in the early 1970s by David S. Bernstein when the Quarry was in operation.